The dead, glassy stare of the eyes on most dolls is kind of creepy. So to help make its newest Cabbage Patch Kid more lifelike and responsive, Wicked Cool Toys is using a pair of tiny LCD displays for the doll’s eyes, allowing them to be animated with all kinds of reactions and expressions. The 14-inch tall Baby So Real is another attempt to revive the unbelievable popularity the original Cabbage Patch Kids toys enjoyed back in the ‘80s, but with some modern technology included to keep today’s kids interested. Thanks to sensors all over its body that respond to touch, tickling, and even games like Peek-a-Boo, the doll’s eyes can blink, look around, and respond to however a child is interacting with it. LED lights hidden inside the Cabbage Patch Kid’s face also allow it to blush, and even develop a light fever that can only be treated with medicine from an included interactive spoon or bottle. It not only helps teach kids to be more responsible, it also reminds them of how much hassle they were just a few years earlier. 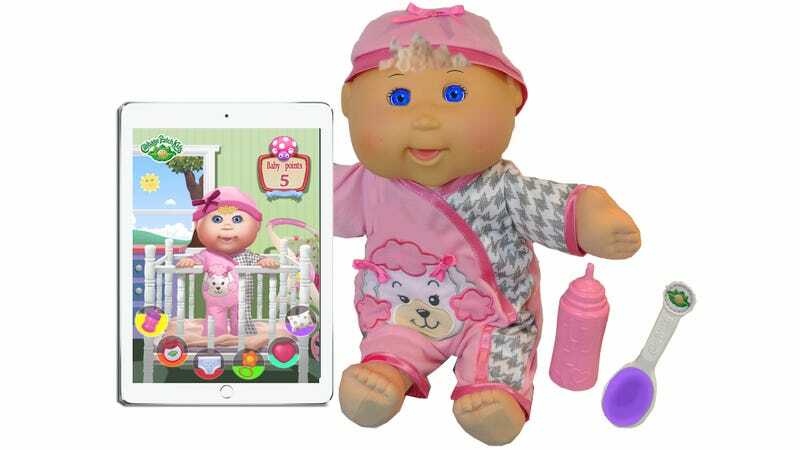 When finally available later this year, the Cabbage Patch Kids Baby So Real will sell for around $100, but for added value it also interacts with a free app for mobile devices that turns a smartphone or tablet into a virtual baby monitor. While kids are interacting and playing with the real doll, the virtual version of it, inside the app, responds with giggles, laughs, and full body animations that provide even more feedback than the doll’s LCD eyes are capable of. The app isn’t required so kids without an iPhone or iPad can still enjoy the toy. But it does help expand the Baby So Real’s novelty, and replay value, through games, virtual accessories, and other unlockable content that encourages the toy to be played with.